County Clare is renowned for its traditional hospitality, traditional music, excellent beaches and rugged beauty – with Shannon Airport as its gateway to the world. It has many attractions, like Ennis the county town, Lahinch Beach and Golf Course, the Cliffs of Moher, and the Burren, which has a lunar-like landscape. The county is very historic and boasts the highest cliff in Europe. It has a spectacular coastline. The area is very scenic and is quite a contrast to the rest of our beautiful Ireland, in that the mountains are limestone, and flowers and plants grow through the limestone slabs. These flowers also grow individually in the Arctic and in the Tropics, but both grow in the Burren. Music and culture abound in County Clare. You’ll hear fiddles and pipes, accordions, and concertinas. Bring your own instrument to many of the area pubs and you can join in a seisiún with the local musicians playing fiddles, pipes, concertinas and accordions. (There’s a wonderful reminiscence about Irish music at travelandleisure). 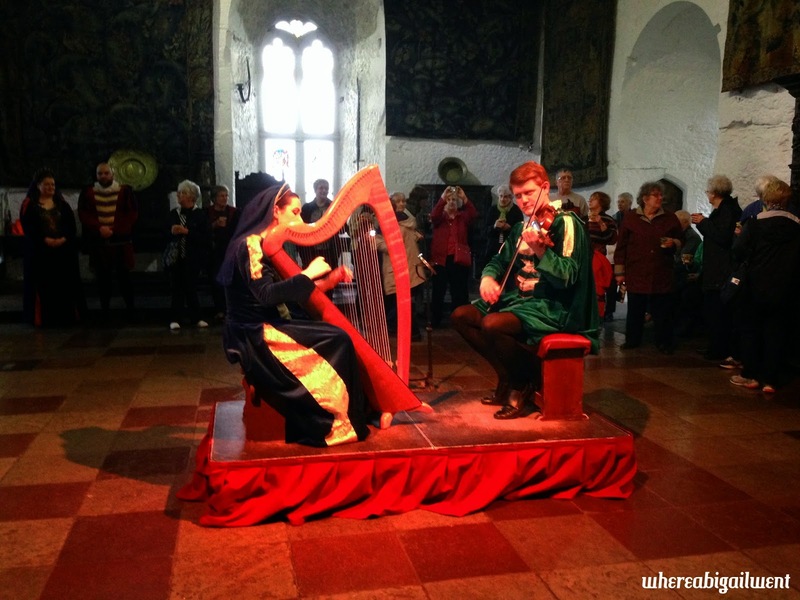 You won’t want to miss Bunratty Castle and Folkpark. Bunratty Castle has medieval banquets, twice nightly, in the Mainguard and Great Hall. The banquets last for nearly three hours and include storytelling, pipes, harps, fiddles, and the famous Bunratty Entertainers. You’ll enjoy a 5-course meal with all the wine you can drink. As of ’05, the banquet is €48.50 (Euros) per adult ( €36.50 for children 10-12; €24.25 for children 6-9, and free for children 5 and younger). Sheila and Frank at Ashgrove will be delighted to make reservations on your behalf.There is also a Traditional Night where there are Irish Dancers, singers, pipes, fiddles, accordions and a fine meal of salad, Irish Stew, Apple Tart and Cream – and of course some wine to wash it all down (but be careful; too much and the old head will ache next morning). The cost is €40 ( €30 for children 10-12, €20 for children 6-9; free for children 5 and younger). This takes place in the Barn in the Castle Yard.There is also a banquet at Knappogue Castle, in Quin, about 9 miles from Ashgrove House. Ashgrove House is 7 miles from Shannon Airport, just a 10-minute drive. Our airport is far more convenient and leisurely than other airports in larger Irish cities, like in Dublin and County Cork. You are in rural Ireland almost immediately as you leave the airport. That makes it especially amenable to the American traveler who has to contend with stick shift and the wrong side of the road. In Limerick, many of our guests are thrilled to tour the sites mentioned in Frank McCourt’s Pulitzer Prize winning novel, Angela’s Ashes. Buses run regularly to Limerick from outside Bunratty Castle. See our interactive day trip planner. For more information on County Clare, see this excellent introduction at the Clare Library.